Congratulations! You managed to get the best mortgage rate. You are now backed up by a written contract proposal. Really, bravo, that's not an easy step but you made it! You are close to finalize your purchase. It's now time for the step I find the most interesting! You have to negotiate the final price of the property and the conditions of the deal. Beforehand, let me share with you all the know how I learnt during my home purchase experience which is useful to be aware of before you start any price discussion. As with any transaction, timing is important in real estate. You need to know where you are on the Negotiation Power Curve so to leverage all your potential appropriately. 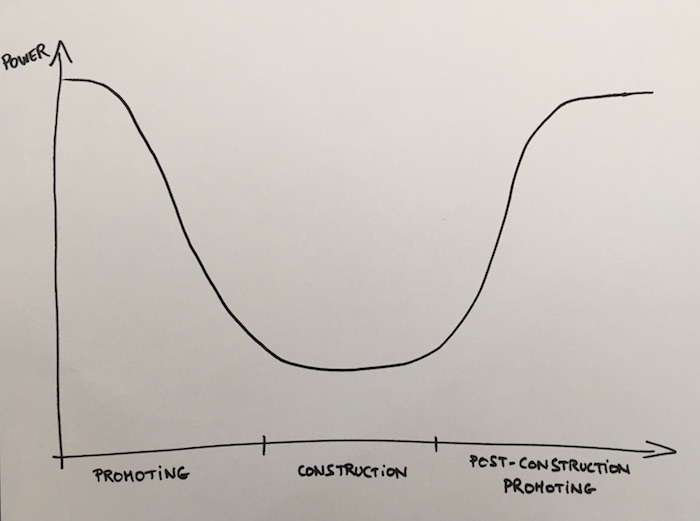 For a real estate deal (at least in the case of a new construction), the curve is split into three phases, each with its different level of negotiation power. The promoter has an architect's plan and a fancy sales brochure with gorgeous 3D photos. He prepares his usecase so to get a loan for his project. That's the phase you want to be in. Your negotiation power is up to the highest and you have a lot of choice! The promoter absolutely needs to find his first buyers to unlock the loan cash, so that he can start the construction work. The promoter becomes a constructor. Caterpillar machines dig holes, masons build walls and the electrician setup the power system. Your negotiation power is quite diminished in this phase. The promoter knows he will sell no matter what as, first, he has no choices, and second, he will soon have real apartments/houses to tour his clients in. He really doesn't like to make transactions during this timeframe as there are many additional stuff that change compared to the initial plan, and the price often needs to be adjusted along the way. Not a good period for buyers. The promoter finished the construction and already moved to another project. He wants to sell fast to reimburse his bank and have the necessary cash to finance his new building. That's a good situation for the buyer, except that you have less choice than in phase #1. Negotiation is not being a bullshitter. It's not about manipulating people. It's not something you're born with. No, negotiation is nothing of the sort. Negotiation is an art. A skill. Something you can learn and hone. There is a book I discovered some years ago. The 101 of "Negotiation". Once you've read it, you'll have a framework to handle any problem that needs a solution (including the discussion with money men). Life changing. I use it for all my negotiations. Please note that this book is all but a way to learn how to put pressure on others, or similar dirty tricks. It's a way to negotiate in a fair manner. A funny fact about it is that it was initially written decades ago, and withstood time. The authors wrote the book as part of a renowned program of Harvard University. Many more books (also part of this program) have been written since then, that are all worth being read. This one is the starting point. It is called "Getting to YES: Negotiating Agreement Without Giving In" (Amazon DE, FR, UK, US). You must read it before your home purchase. As an example, we can fill the step 2 together based on the negotiation power curve we just discussed before. When you are in the first phase "Promoting", one clear interest of the promoter is to sell his first apartments as soon as possible. His position may be to stick to the brochure price, but you can satisfy one of his interests by signing the contract right away instead of taking your decision after several days or weeks — in exchange of a discount obviously. On the other hand, one interest of the promoter during the second phase "Construction" is to finish the building the soonest possible. He doesn't want to bother with sales nor with tile-color-choice workshops. If you try to get the deal against other potential buyers, one way to satisfy his interest could be to commit to a maximum number of workshops, and also to deadlines for your choices that you will respect carefully. This could help you to win the deal. In the third phase "Post-construction promoting", the promoter wants to sell quickly, again. By stating you're paying in cash, you could sign at the notary office the next morning with money in his pocket the day after. You unlock his next building funding. He offers you a decent rebate. These situations are only examples to show you how one can — and need to — be creative when looking for solutions. For sure there are many more interests to be uncovered in order to propose appropriate options that provide mutual gains for both parties. How it went for us — including numbers, yeah! On our side, we had a crush on this apartment. We never saw a new construction with so much character, in our area, and so "affordable". Our interest was to buy our first home. We knew we were backed up by financial institutions up to CHF 700'000. The initial price displayed on the online ad was CHF 670'000. We were so excited that we forgot to hide it during the first visit with the salesman, in order to keep some negotiation power for later on. The guy told us to think about it for one or two days, and to contact him back if we wanted to make an offer. It was somehow pre-booked for us during this timeframe. We were so angry and disappointed. What to do. Just give up? Or accept and sign for the home we were dreaming about? Side note: When I think about it nowadays, I can't help myself but to still think that the real estate salesman talked to DL, who informed him about our top limit of 700kCHF. Then he called the promoter to let him know about a potential buyer, and they played this fake meeting to announce us the additional expenses. Coincidentally, the new price was just corresponding to our maximum target... we will never know. I'm sure it wasn't that legal (if you're lawyer, your opinion would be appreciated!) to propose an offer about a displayed price and not respect it. Although the guy was smart enough that he didn't ask for a proper offer, we nevertheless confirmed our interest for 670kCHF by email and asked to meet to finalize the deal. We tried with a proposal of 690kCHF. The promoter made a counter-offer of 700kCHF, with an additional 5kCHF envelope to spend on kitchen equipments. They played the "Take it or leave it game". We didn't want to play the "We don't accept, our last price is 690kCHF" as we really wanted to buy this home. We accepted the promoter's deal. In another situation where we'd have had more than one apartment option, we'd have asked to negotiate directly with the promoter, but that was far from being the case. To give you a timeframe, the first visit was the last week of May, and we closed the deal during the first week of July. We learnt the following lessons: treat your home purchase as a business transaction, at least in front of the sales; don't be as emotional as we were during the visits; don't show your excitement in the emails you exchange; don't give numbers, stay vague; and finally, don't accept to hand in numbers to third party partner companies as it's almost sure some information will get disclosed in one way or the other, and will be used as a negotiation tool to not lower the price — or even raise it! You're about to make the biggest purchase of your life. It's a great adventure. As such, it needs to be prepared. You need a strategy. Read this 101 negotiation book that you can find on Amazon (DE, FR, UK, US). Once you'll have gone through it, I will need you to focus. To be determined. Remember one thing before any visit or apointment: the next thirty to sixty minutes will be decisive for the base price and interests you will pay during the next decades. You have to feel confident like an athlete before a competition. It is your competition. You set the rules. You win! Don't hesitate to come over the blog and ask for support if you're in this hardest step of the process. Whoooaaaaa! You got out of this intense negotiation apointment. You closed the deal! Congrats! Now that you agreed on a price, go celebrate to recharge your batteries. The next run is coming. Although you're very close to the end, you need to be careful as that's during the next step that you will sign for what will be your rent during the next five to fifteen years. There are many contractual details to be aware of. We'll review them. I'll also explain you how our lender cheated on us, so that you don't fall into the same trap. If you're on your way to home ownership (or already a home owner), let us know about your negotiation best practices. Note: if you choose to buy the book, I'll get an affiliate reward from Amazon — without you paying more for the item. As usual, be aware that I only share book references that I've read. I recommend them in the hope that they will bring you as much value as it did to my personal life.